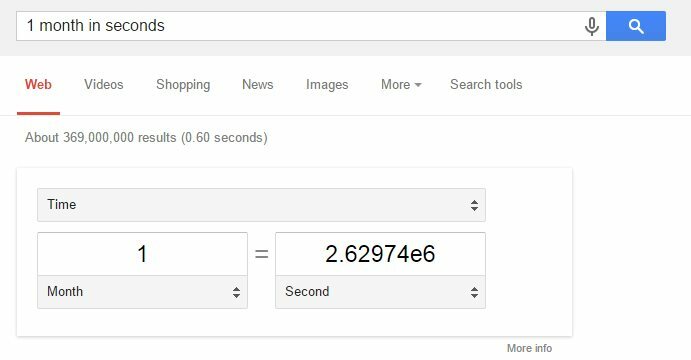 Google has improved its calculator a few years ago, and that update has brought scientific notation to the results. Before this update (years ago), when I searched "1 month in seconds", Google gave me "2629743". Now, it gives me "2.62974e6" as in the screenshot below. Do you know if there is a way or a workaround to get the real number again? I know I can manually convert to a number that is not in scientific notation, but that requires manual work and it is not a precise number. As far as I know there is no way to change the notation. When this answer was originally posted an alternative was to use Google Web Search in another language, like Spanish, but at this time it also return a result in scientific notation. Way to disable Google's “Results for Similar Searches”? Can I use Google's old engine?